It allows your posts in the respective platform to be cross-posted automatically into the Steem Blockchain with the proper setup. This post is focusing on setting up Twitter to Share2Steem. When you have linked an account before on your share2steem, it no longer prompt you to link account so in order to link other accounts, click on "Social Network(3)" on the side tab and it will load up the page showcasing what account has been linked with. Click "Link Account(4)" and select "Twitter(5)" in order to begin the linking process with. Enter your Twitter username into the given field and click "Check Account(6)". 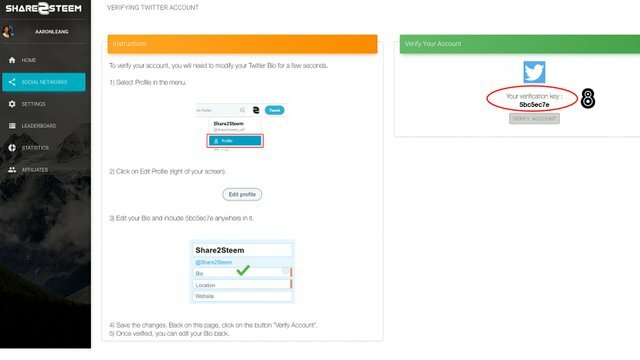 Once your account has successfully linked as shown on the image below, it's time to verify your account by click on the "Verify Account(7)"
*Note - Twitter username is shown right on your profile as shown below. Everyone will get a different "unique verification key(8)" assigned by S2S when you're doing the account linking. You'll need to use this given key onto your Twitter profile's bio as shown on the image below. Head over to your own Profile, click "Edit Profile (9)" and enter the Unique Key given by S2S to your "Bio description(10)" on your profile and save it. Head back to your Share2Steem and click "Verify Account(8)" which is just below your verification key. Congratulations! 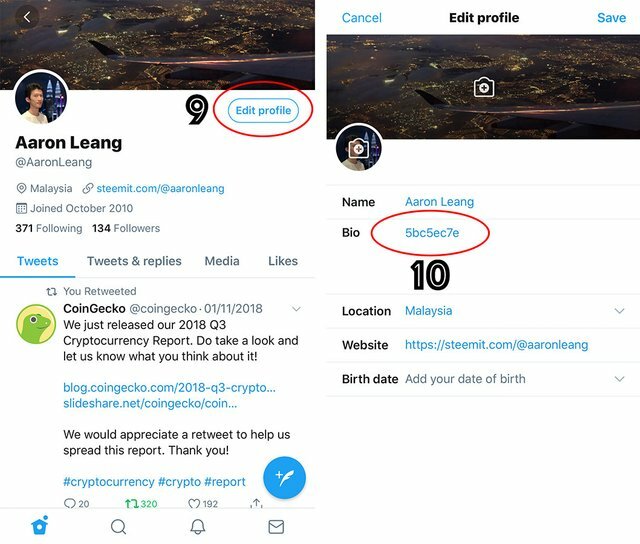 Your account is now being verified and you can start Tweeting via Twitter and cross post your tweets to Steem Blockchain but do note that there are some steps you'll need to perform in order to successfully post in Steem Blockchain as well. Now! 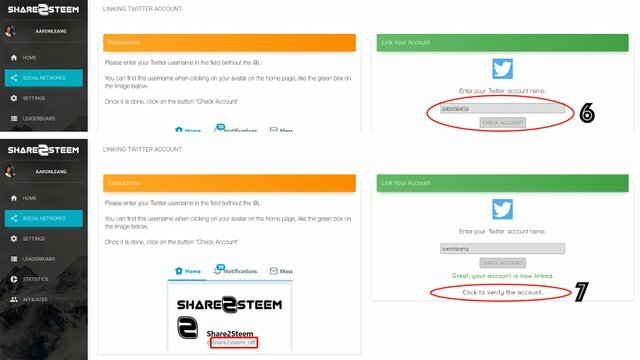 In order to post in Steemit together as well, you'll need to include "#share2steem" (11) inside your post. 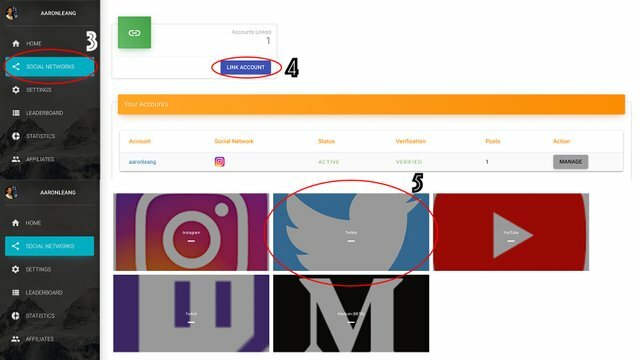 Up to 5 hashtags/keywords will be shown on your Steemit post, any extra will not be displayed. If you do not want to post in Steemit but Twitter only, then just post normally without include the #share2steem tag. Click Tweet on your Twitter and voila! 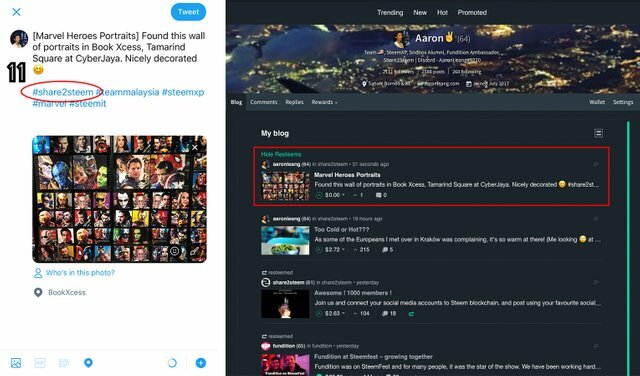 Your post will be displayed onto your Twitter and Steem Blockchain within few seconds! **Recent Update from Share2Steem - [Your Title] onto your Tweet or Instagram and it will auto post to your title as shown on the photo above! 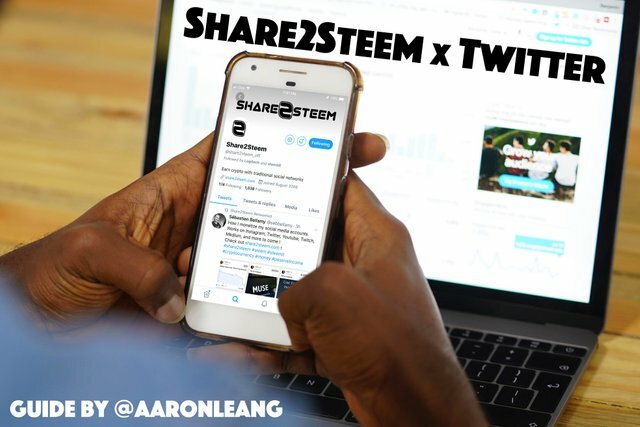 Another option allows you to cross-post all your tweets without using the #share2steem tag. Only main tweets will be posted, not answers nor retweets. The reward of this comment goes 100 % to the author aaronleang. This is done by setting the beneficiaries of this comment to 100 %. You got a 62.84% upvote from @ocdb courtesy of @aaronleang! Memang very easy to use. This is amazing! Thanks for sharing this tutorial. 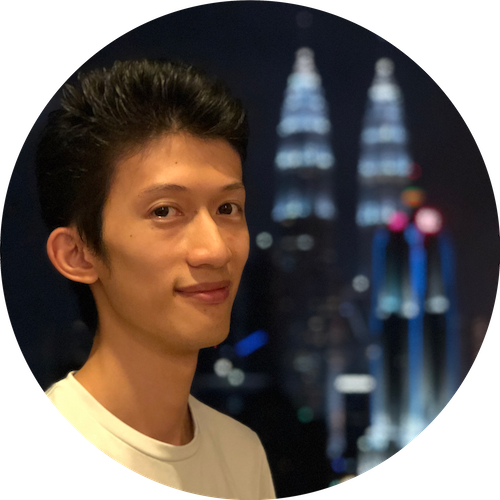 We have a lack of tutorials about the steem tools, and with that, many people could have their questions solved. Your UA account score is currently 4.048 which ranks you at #3444 across all Steem accounts. Your rank has improved 4 places in the last three days (old rank 3448). In our last Algorithmic Curation Round, consisting of 290 contributions, your post is ranked at #132. How about for instagram? Does it work the same on removing the tag #share2steem if I do not want to post it on steemit? 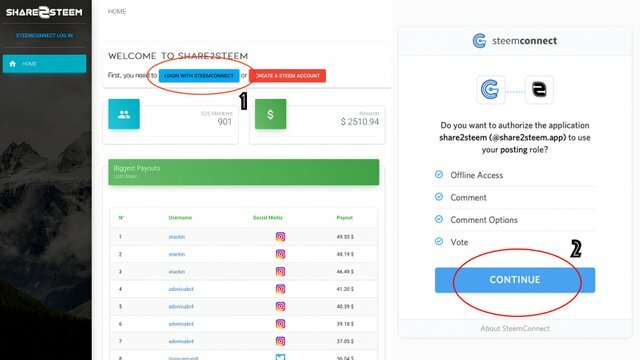 Yes, if you do not want to post to steemit, just post as normal without putting the share2steem hashtag. Thanks for your work. We are just setting up the beta version of our own social network ImpactN, supporting peer2peer sharing of time, talent and money. It would be great to include a share2steem property as well. How could we proceed best to do this real fast? We'd love to put the product in front of the eyes of the world at United Nations Global Festival of Action on May 2nd. Sure @impactn, please contact @algo.coder on the collaboration.